Compact and durable, our best brass lamp-ready spotlight. 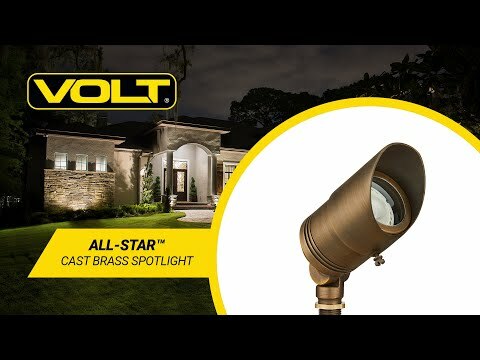 The VOLT® All-Star™ Spotlight is a new generation of lighting fixture designed for replaceable MR16 LED bulbs. It features a compact and efficient body with fins designed to draw heat away from the LED lamp. Other performance features include an easy-to-adjust (and secure) knuckle and a 360º adjustable glare guard. We combine the best features of our most popular spotlights into one premium fixture. Perfect for uplighting trees, buildings, structures, flags, and more. Dimensions Entire Fixture: 4.16" x 2.36" Shroud: 2.16" x 2.36" Body: 0.91" x 2.36" Stake: 10" x 3"